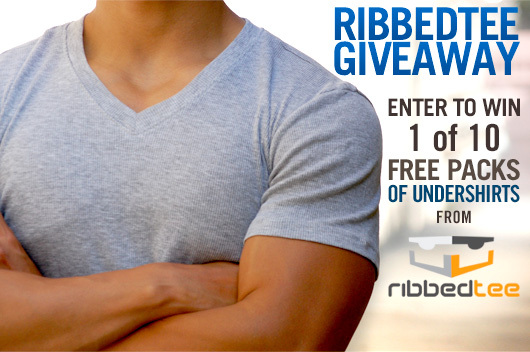 RibbedTee Giveaway: Enter to Win 1 of 10 Packs of Undershirts from RibbedTee! This isn't your typical boxy undershirt. We've teamed up with RibbedTee to giveaway 10 packs of their ultra-comfortable Classic Fit undershirts! What’s the point of looking good if you can’t be comfortable doing it? Everyone looks sharp in a suit, but there’s a reason we don’t wear them out to brunch on Sunday – they’re not the most comfortable articles of clothing in our wardrobes. To soften the edge of spending all day in a dress shirt, and to protect those expensive shirts from sweat stains, we turn to undershirts. They offer a cool, comfortable layer between us and our business attire, all while giving us a relaxed wear option for the weekend. At least, that’s how we see them in a perfect world. In the real one, undershirts can be cheaply made of lesser material, and fit poorly. You seem to be stuck with a boxy t-shirt on one hand and the super comfortable but stylistically unacceptable A-frame tank top on the other. And as we mentioned in our list of Six No-no's for a Suited Man, you shouldn't be wearing white undershirts and “beaters” with light colored shirts. 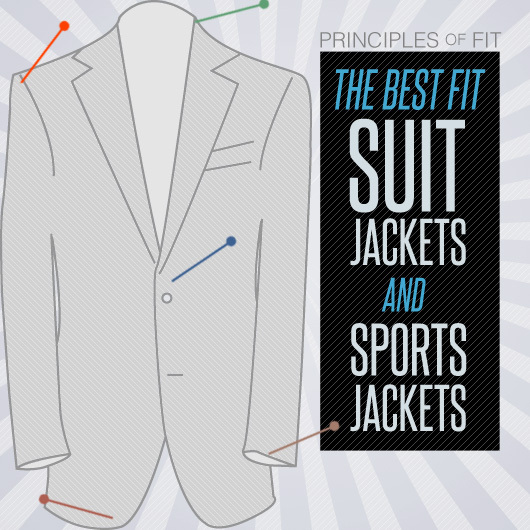 A white undershirt stands out beneath your white dress shirt; if you choose something gray, it'll blend better and have a lower proclivity to awkwardly stand out when your jacket comes off. Further, since we're part business and part party, when it's time to loosen the tie and open the shirt, you'll find a V-Neck is more streamlined, as it cuts down low enough not to poke out the collar opening like you're hanging out after getting your yearbook picture taken. A-frame shirts, while comfortable and offering a low neck opening, shouldn't be visible to anyone in public. Unless you're a brooding actor or ripped model wearing a $75 tank, it's generally not a good look anywhere else. Admittedly, all these rules limit what we can wear underneath our work clothes. Something that isn't bulky under a dress shirt, but looks good on its own, and combines the benefits of a v-neck t-shirt and the advantages of an A-frame. If right about now you’re having a light bulb moment and thinking – what if there was a shirt that was as comfortable and form-fitting as the ribbed cotton of a tank top with the style and versatility of a regular t-shirt, you’re too late. RibbedTee beat you to it. There are a few reasons why it’s actually a pretty good idea, at least when it’s executed well and made right here in the US of A. The varied shirts offered through RibbedTee.com are guaranteed not to have a sagging collar, never bunch up, and they’re cut long enough so that they stay tucked in underneath your dress shirt. The standard offering from RibbedTee will set you back around $10 a shirt, which may seem high for an undershirt until you get your hands on a pair. The material is soft and strong, composed of 90% cotton and 10% polyester. They’re immensely comfortable and very stretchy – you could probably even order a size down from what you normally wear if you want it to be snug. It seems no matter how tight the shirt gets, it never binds and it feels very light. Normal tees, when too tight, create a feeling of chafing and claustrophobia, while the RibbedTee somehow manages to hold tightly without feeling like a clingy girlfriend weighing you down. You can find the shirts in a variety of styles, such as crew neck or v-neck, and they come in three colors: white, black, and our favorite: heather gray. While the RibbedTee selection costs more than a pack of Hanes, with the quality, American production, and long lasting construction of the shirts, you only need a few shirts to beef up your wardrobe. Check out our friend Anthony's review over at Real Men Real Style. This guy knows his stuff, and he loves 'em. But don't just take our word for it. We’re giving 10 Primer readers a shot to try these on – for free. It couldn’t be simpler: all you have to do is enter your info below, and we'll randomly choose 10 lucky winners. The winners will get to choose which color they'd like, offered in black, white, or gray. We've got our winners! Congrats to the 10 following Primer readers who snagged a pack of classic undershirts from RibbedTee! 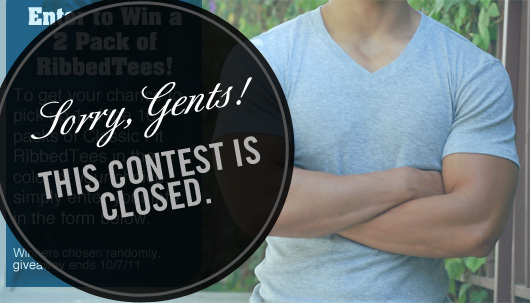 The contest ends 10/7/11. Sorry, open to US residents only. (Shipping ain't cheap!) Read the full official rules here. My husband prefers this kind of under shirt because its more comfortable and cool inside. On a hot sunny day its very hard for males to maintain coolness because of the clothes that they wear. I own a few grey v-neck undershirts, but they aren’t ribbed and they always sag. Grey is definitely the way to go though, looks way better under white shirts.These look really nice. Shame on me for never knowing about the grey under light colored dress shirts. I always hated that you could see the white, but how silly of me to not realize grey would nearly alleviate the problem. Thanks to Robert for this NEED TO KNOW information. Always a pleasure to read the articles on Primer. Nice pics, Andrew. Thanks! I usually don’t wear undershirts because of the white effect. These’ll be perfect though. Another benefit to a grey undershirt is that, unlike white, they won’t start to look dull and dingy after a handful of wearings and washings. There’s nothing lamer than comparing your brand new, electric white undershirts to the old, dull ivory ones – pit stains and all. Hey guys! 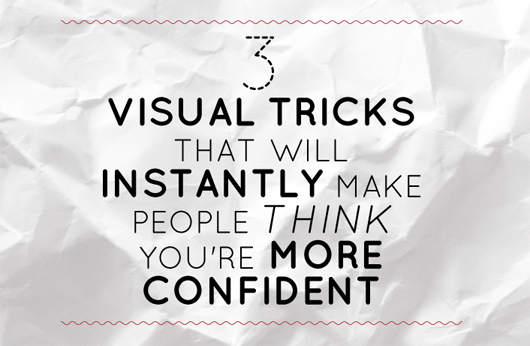 Great tips in the comments, thank you! Ben, that’s a great point, especially when wearing a white dress shirt a dull white undershirt looks even worse. The grey undershirt tip has been one of my favorite simple things. I’ve only got one, so far, but I always make sure to save it to pair up with a white dress shirt when the occasion arises. looking forward to furthering the heather gray uprising! Made a beleiver out of me. Keepin’ my fingers crossed for the giveaway! My undershirt of choice are Stafford heavyweight or performance in gray or white. They’re the best fitting ive found but they’re so thick. Terrible for summer wear. Anything less than heavyweight doesnt seem to hold shape though. They’re about the same price as these shirts ($25 for a pack of 3) but these seem like they would be alot more comfortable. I was about to order a pack of these a few weeks ago but the prices seem a bit too high. If you’re giving them away though, you can’t beat that, and it’d be nice to try them out before I switch over from Hanes.